Outpassage Will Knock Your Socks Off! Dennis (Det) Cox is a soldier. He believes in his own abilities. To say that he believes in truth, justice and the American way might be pushing it a little. But he’s a man of honor and fights with all he has to protect his own. Paige Barnett is a corporate of the highest order. Her boss, Raymond Godfrey (God), is the head of IST, the most powerful corporation on Earth & beyond. Paige knows how to play the system, but finds herself in hot water when she raises too many questions about incidents on a distant planet, known only as X-31A. Paige’s life changes dramatically when she meets Det Cox on a blind date arranged by a dating service. Both are drugged and shanghaied, transported to another distant, mysterious planet, X-66B. There, Paige meets Freedom Ayoub and a wide variety of other people who preach about redemption, resurrection and the holy way. Things go from bad to worse when Det’s soldiers are told to put down a revolution on X-66B, using any means possible. 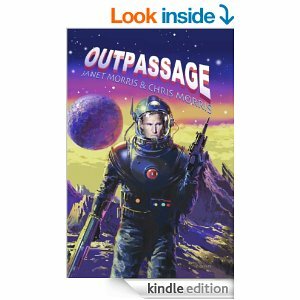 Outpassage, a new offering by Janet Morris and Chris Morris, takes the reader back to the roots of off-world sci-fi adventure. It’s full of intrigue, action, political power plays, as well as redemption, resurrection and the holy way. A thrill ride from start to finish, this book moves forward with the force of a freight train, leaving the reader begging for more. I hope that the Janet & Chris plan more books, making this into a series. They have laid the groundwork for more amazing books with Det and Paige at the helm. The dialogue in Outpassage is snappy and keeps the story moving. It is also used as a very effective characterization tool. Each character has his or her own voice. Det Cox is hard bitten, all business and slightly paranoid. His words are peppered with sarcasm and cynicism. He’s a soldier, pure and simple. He takes nothing at face value and believes only what he can definitively prove. Paige Barnett is a cultured, well educated, rich woman. Her pampered existence comes to an end, but she doesn’t falter or give up in the face of adversity. If anything, it makes her more determined to find her way home and bring justice to the deserving. She can be diplomatic, but she knows when not to be. She might freak out a little when the bullets fly, but she doesn’t let it get her down for long. She always bounces back, more determined than before. Freedom Ayoub is an enigma. He takes Paige under his wing, helping, guiding and protecting. His gentle determination encompasses the other three main characters. His is a fascinating character study and I hope that he will be explored more in other books. Allie Frickey, Det Cox’s Corporal, is pure soldier. She’s as good at what she does as Cox is. She does her best to protect him and their charges, Paige & Freedom. She is bold and tenacious, much as Paige is. I greatly enjoyed Outpassage and highly recommend it to those who like a great sci-fi tale that doesn’t include Vulcans or androids or phasers – oh my!